When I was a kid, we weren’t allowed to watch much TV. In fact, only Blue Peter, Newsround and Playschool were allowed in our house. No Dr Who, no Grange Hill, no Charlie’s Angels, no Cagney and Lacey ( and I’m not saying I’m scarred by any of this but playtimes were tough in the 70s when you had no idea who shot J.R. or how to do your hair like Farrah Fawcett!). Luckily, we had one babysitter who would let us watch episodes of Hotel and The Love Boat. And one Grandma allowed Dynasty and Fawlty Towers at her house, whilst the other permitted Emmerdale Farm (we took what we could, but we knew which house we preferred!). Anyway, this early deprivation did not perhaps have the result my parents intended. Instead of making me a discerning viewer of screens big and small, it turned TV and movies into my favourite guilty pleasures (even ahead of chocolate – and that’s saying something!). And my tastes aren’t always that highbrow either – Nashville, Gossip Girl, Made in Chelsea, Gray’s Anatomy …. My mother (who only watches documentaries on BBC4, plus Downton Abbey, Springwatch and Call the Midwife) clearly despairs of me! But as a result, my books are as much influenced by movies and TV as they are by reading – or even real life. I Predict a Riot is actually written as a movie – sort of. Amateur film-maker Maggie is dealing with her parents’ divorce by hiding behind the lens of a camera. In Tokes she finds the perfect subject for her movie – and Little Pea wants to be a film star too – but when she accidentally films a stabbing – and a riot – she finds that movie making is a more dangerous business than she realised. The whole novel revolves around the movie. Camera angles, close ups, voice-overs, the rules of screen writing and the mechanics of movie making are essential to the plot. So I figure all those hours spent in front of the box, or munching popcorn in darkened movie theatres has been well spent. But which movies/TV shows most influenced what I wrote? Well, Francis Ford Coppola’s The Outsiders has to be the first. It’s based on the novel by S.E. Hinton which I read when I was thirteen, although I didn’t see the 1983 movie till I was in my thirties. S.E Hinton wrote The Outsiders when she was only 16. It’s a coming of age novel about a gang of kids who have to fight for survival on the streets of Oklahoma. Francis Ford Coppola’s film adaptation helped spark the Brat Pack genre and launched the careers of many of up-and-coming stars, including Rob Lowe, Emilio Estevez, Matt Dillon, Tom Cruise and Patrick Swayze. I wanted to capture the same flavour in I Predict a Riot, which explores modern day gang culture in South London, the dangers of life on the streets for kids from deprived estates, the prevalence of knives and guns, police harassment, stop and search laws, poverty, abuse, neglect – all the factors that led to the UK riots of 2011. I also wanted to create characters as memorable as Hinton’s Ponyboy and Sodapop who are complicated, brilliant, funny, self-destructive, clever, law-breaking, moral, messed up – utterly compelling. And friendships too – unlikely alliances between kids from different sides of the tracks, forged through shared horrors, nearly broken, fractured, but finally enduring. Maggie might be responsible for the death of one of her friends and ruining the life of the other – but I Predict a Riot is still a novel about the redemptive power of friendship. Just like S.E.Hinton’s book and Coppola’s film. Then there’s the utterly brilliant Son of Rambow which also popped up in my first novel We Can be Heroes and continues to exert its influence over I Predict a Riot. A movie about a couple of kids who set out to remake the Sly Stallone film classic ‘Rambo’ with a bunch of French exchange students, it is funny, moving, poignant, utterly brilliant. The kids in I Predict a Riot also set out to make a movie (or perhaps more of a docu-soap like Made in Chelsea or The Only Way is Essex – both of which feature in the book!) but end up involved in a riot, so it’s a lot darker than Son of Rambow. Things starts off funny but the story takes a much darker turn when Maggie takes compromising footage of Shiv, the ruthless leader of the Starfish gang, (who is slightly based on the nasty Voltori in the Twilight movies – for which movie reference I blame Katie the Czech exchange student who stayed with us and whose obsession with Taylor Lautner has left a lasting mark on me!). For my depiction of gang culture and kids from some of the most deprived estates in South London, I drew on my own experience working with youth groups in Peckham, but I also take a lot from the TV series Youngers and Top Boy. In fact, in my secret fantasy where I Predict a Riot gets made into an Oscar winning movie, I’ve already figured out exactly which actors I want to cast from those series (and if any author tells you they haven’t secretly cast the film version of their book in their head, they are lying!). Top Boy is a visceral and uncompromising depiction of kids growing up on a London estate ruled by drug gangs. It is, in my opinion, one of the finest pieces of TV produced in recent years. What it does – and what I was determined to do in I Predict a Riot – is to turn assumptions about class and race on their heads. It challenges preconceptions about kids growing up in poverty, creates unlikely heroes, asks us to sympathise with lawbreakers, gang leaders, drugs pushers. It also forces us to examine the reasons why people break the law – why kids go off the rails. And that’s what I was compelled to do after I saw the media coverage of the UK riots in 2011. I hated the assumptions that were made about the kids who were involved and I wrote a novel which set out to challenge those. My late night Channel 4 habit is also supplemented a couple of black and white classics, including David Lean’s 1946 version of Great Expectations – which I watched over and over because my sister was studying it for O’Level (educational films passed the parental censors, you see!) Maggie lends Tokes a copy of Great Expectations near the beginning of the I Predict a Riot and Tokes quickly comes to realise that he’s like Pip, the kid from the wrong side of the tracks who gets caught up in the web being woven by the posh girl in the million pound house. But first love and a desire to escape from his gangland roots and make a new life for himself will ultimately destroy Tokes in the same way they do Pip. Oh, and the ending is based on Great Expectations too – but since Dickens wrote two different ending to his novel, I’m not going to tell you which one I used! One of my favourite reviews of I Predict a Riot compares my character Little Pea to the Artful Dodger, another of Dickens most famous creations. Because, forget the saccharine musical versions, Dickens wrote with a clear social agenda. He wrote to expose the poverty and inequality in his contemporary London. In particular he exposed the plight of kids living in urban poverty – he asks us to sympathise with child pick-pockets and criminals. That was pretty ground-breaking at the time. I Predict a Riot blog tour! I’m not claiming to be Charles Dickens, but I Predict a Riot was inspired by the time I spent helping out on youth projects in South London, working with gang members and kids from some of the most deprived estates in the capital. And I wrote the book to give them a voice, to try and tell the story of the kids who feel that the whole of society has given up on them. Unlike Dickens who had experienced devastating poverty as a child himself, I can only ever witness events as an outsider. That’s why I tell the story from the perspective of the white middle class onlooker, Maggie, who gets things wrong, misunderstands, makes mistakes. 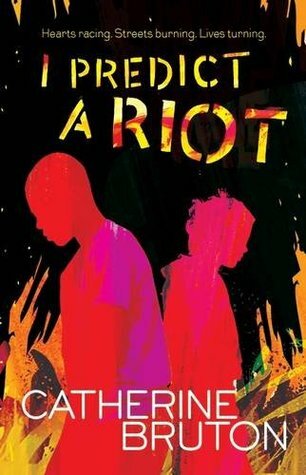 If you want to see the story told by the young rioters themselves, I recommend you check out some of the incredible films like ‘Riot from Wrong’ – which also had a powerful impact on my book. So many movies, so little time. There are tonnes more films/TV series that had an impact on me as a writer: Fishtank, Stand by Me, The Knife that Killed Me (out on general release this summer), Millions, Africa United, Skins, My Mad Fat Diary to name just a few. So my mum and dad might have reckoned I’d get square eyes by staring too long at the gogglebox, but in the end I think films and TV have made me the writer I am – for better or for worse. And, there are plans afoot to make We Can be Heroes into a movie, and already production companies showing interest in I Predict a Riot so, who knows, perhaps one day I’ll get to walk down the red carpet to see the film premier of one of my own books too! Oh, but whatever shall I wear….? I love this post – film has such a strong influence on her novel, it’s intriguing to hear the details that inspired it.